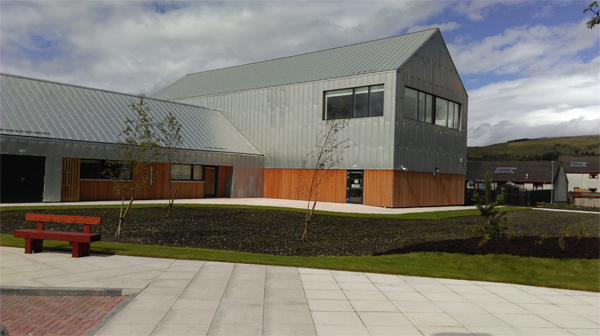 A traditional standing seam system using Aperam UGINOX Patina K44 stainless steel was specified for the £7 million Fort William Gaelic medium primary school in Caol. A £36 million building programme saw three new primary schools built in the area. Metal roofing and cladding specialist HL Metals undertook the stainless steel installation which extends from the roof into walls on buildings with both gabled and hipped roofs. UGINOX Patina K44 is a ‘terne-coated’ bistabilized ferritic stainless steel with an electro-tinned coating on both sides. Ferritic grades offer greater price stability than austenitic grades through the absence of nickel but without compromising the metal’s high corrosion resistance. The inclusion of molybdenum also makes it ideal for coastal and aggressive environments and specifications without underside ventilation. The ‘terne-coated’ finish weathers to adopt a matt grey appearance which is reminiscent of lead but a low coefficient of expansion (half that of zinc) enables it to be used in long tray lengths.